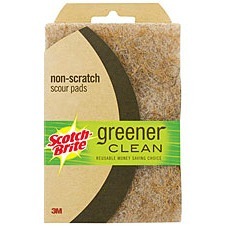 Dolores has shared her Scotch Brite Greener Cleaner scour pads review. These "greener clean" products from Scotch Brite are relatively new, and are advertised as a more eco-friendly and sustainable alternative to more traditional sponges and scrubbers. These scour pads are made from 50% agave plant fibers and are sold in 100% recycled packaging. The retail for about $2.99 for a two-pack, but I have found that there is often Sunday coupons for either $.75/2 or $1.00/2 in the newspaper, making them priced competitively with less eco-friendly products. I really like these scour pads and use them often. I would rate them four out of five stars. They work very well, and do not scratch stainless steel cookware, utensils or containers. In addition, they don't scratch porcelain, ceramics or glassware, and they get even stubborn bits of food off very effectively. The only reason I wouldn’t give this product a five star rating is that it doesn’t seem to have the durability of the original non-green Scotch Brite scour pads, and it seems to wear out and lose its scrubbing power more quickly. That being said, I would definitely recommend the product to anyone. It rinses cleanly and has no foul odor when left to air dry. I've used them to clean all kinds of things, including cast iron skillets, plates, glasses, pots, pans, utensils and ceramics with it. Thanks Dolores for your Scotch Brite Greener Clean scour pad review. Since this is a pretty new product, I would love to hear from other people who have used it to share their opinions about it. Has it worked well for you? In addition, I am still investigating how "eco-friendly" these sponges and scrubbers really are. As I've discussed, some green cleaning supplies are greener than others. It does sound like it has more plant based, and thus sustainable, materials within it. However, the fact that it is only 50% made from plant fibers means it is still not ideal. Of course, man-made fibers just may be better for scouring things, so I would be interested if anyone has found an even greener alternative. You can share your Earth friendly cleaning products review here telling me what green way you scrub surfaces in your home, especially your dishes, pots and pans. Join in and write your own page! It's easy to do. How? Simply click here to return to cleaning sponges . After reading a couple of reviews about Scotch Brite's greener clean sponges and scrubbers from other readers (see above and below), I definitely wanted to try them out for myself. I typically use a blue non-scratch sponge for normal dish washing, so I chose a similar sponge from this more eco-friendly line to use in its place. First, I should note that they look a bit different, in that they have a much more natural color and are not bright colored fake sponge colors like I'm used to. I didn't personally mind this at all, but my husband who is rather change adverse never has liked this sponge just because of the way it looks. He avoids using it when he needs to wash dishes. It's silly really, since in my opinion it works just as well as a regular sponge, mostly. The sponge part is basically the same. The non-scratch scrubbing surface on the top isn't as durable though, so it begins to disintegrate a bit faster than with a more traditional version, but still not too much. I was also concerned this product might not make it through multiple washings in my dishwasher, even though this is the recommended method for cleaning and freshening this product to let it last longer. My fears have turned out to be unfounded though. I've now run the sponge through the dishwasher on several occasions and it has faired well, and it definitely keeps it from smelling like all sponges can get after they've been used for a while. Overall, I've been happy with this product, and would definitely buy it again. I think they last almost as long, and work just as well as regular versions. Plus, since they're more sustainable for the environment it makes me want to use them again. Dot has shared her review of the Scotch Brite Greener Clean non-scratch scrub sponge. 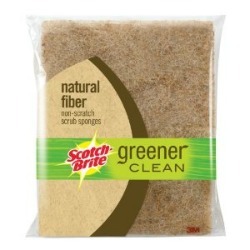 The Scotch-Brite Natural Fiber Scrub Sponge is a great cleaning tool. It has two sides, a cleaning side and a scrubbing side. Most of the time the cleaning side is the best to use being that it deep cleans without scrubbing and doesn’t leave any dirty spots. I use one scrub sponge for everyday kitchen cleaning tasks, and another one for bathroom tasks. I clean the outside of the dishwasher, counters, microwave, kitchen sink, floor, bathroom sink, tub, toilet and tiles with this wonderful scrub sponge. It works well with any normal cleaning task, but I would not use it for any sort of scrubbing task beyond scrubbing small amounts of dirt and grime. I think this sponge isn’t meant for cleaning pots and pans or things of that nature. It would most likely fall apart if it was used for removing burnt food. Although it is a great product for the light cleaning tasks I've mentioned, it just isn't as durable as a Brillo pad or other comparable products. On the other hand, since this scrub sponge is so gentle it won't damage pots and pans or remove nonstick coating. I do like that it is very easy to clean the Greener Clean sponge. I just throw it in the dishwasher during the wash at least once a week to prevent it from getting smelly. I think I paid about three dollars for this item at Walmart, and I feel like it was money very well spent. 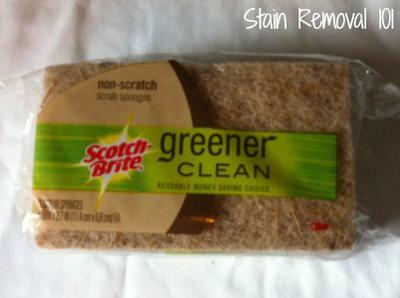 Thanks Dot for sharing your review of the Scotch Brite Greener Clean non-scratch scrub sponge. Normally, I would think of this product as something used to clean pots and pans, along with the types of cleaning tasks you mentioned. Therefore, to hear that it is just not as durable is a bit disappointing, but I am glad to know. Actually, another reviewer (see above) made the same comment about durability, but in regard to the scour pads. I would guess if you were interested in one of these products as a pot scrubber, you might want to try the scour pad instead of the scrub sponge. Has anyone else used any of these Greener Clean sponges and scouring pad products from Scotch Brite? If so, I would love to hear your opinion about them, and experiences with them. You can share your kitchen and cleaning sponges review here, for this brand, or any other, telling me what you like, or don't, about them and why.